The recent “mini-crisis” in the strategic Strait of Hormuz was sparked by Iranian forces’ “harassment” of two cargo ships and an overreaction by the United States. Fortunately cooler heads prevailed and the “crisis” dissipated. Hopefully lessons were learned on all sides and measures will be taken to avoid such overreaction in future. On April 24 Iranian Revolutionary Guard (IRG) patrol boats approached the U.S.-flagged cargo ship Maersk Kensington in the Strait in a manner that the Kensington’s master deemed “aggressive.” On April 28, IRG forces fired warning shots at the Marshall Islands-flagged Maersk Tigris in Iranian claimed waters and arrested the vessel pursuant to a court order regarding a financial dispute. Clearly the nuclear negotiations and behind- the-scenes conflict between the U.S. and Iran in several key Middle Eastern countries have created a tense and malevolent atmosphere between the two. In such a situation an inadvertent confrontation could quickly escalate. Of course, Iranian and US officials and military commanders are – or should be – aware of this. Indeed, none should forget the horrific 1988 incident in which the USS Vincennes downed an Iranian commercial airliner, killing 290 people. It turns out that these latest incidents were a result of confusion, misunderstanding, and lack of communication on all sides, exacerbated by the media. However, these incidents were certainly not the first such confrontations in the Strait. An incident in January 2008 serves to illustrate the problem – and the danger. That incident involved three U.S. naval vessels and five IRG speedboats. The U.S. claimed that the IRG speedboats threatened the U.S. naval vessels while they were engaged in what the U.S. claimed was transit passage. That incident was at least partially a result of an ongoing Iranian-US dispute over applicable law of the sea. It is also germane that on several occasions Iranian officials have allegedly threatened to block the Strait. The Strait of Hormuz is bordered by Iran, Oman and the United Arab Emirates. The U.S., Iran and Oman have different interpretations of international law regarding maritime claims and the applicable navigation regime in the Strait. Oman is one of 164 states parties to the 1982 UN Convention on the Law of the Sea which entered into force on 16 November 1994. Iran has signaled its support of the Convention by signing it. However, it has not yet ratified or acceded to it, and arguably is not bound by its specific contents. The U.S. remains the only maritime power not a party to the Convention. The Convention allows a coastal State to draw straight baselines along an indented coastline and to claim a 12 nautical mile (nm) territorial sea from these baselines. Iran claims straight baselines along its coast bordering the Strait and from these baselines a 12 nm territorial sea encompassing the northern third of the Strait and the in-bound designated sealane. It also claims three islands just west of the Strait and 12 nm territorial seas around them encompassing the inbound and outbound designated sealanes. At some point in their passage into and through the Persian Gulf, U.S. warships must pass through Iranian-claimed territorial seas. Iran’s publicly declared position is that countries that are not parties to the 1982 Convention, like the U.S., cannot avail themselves of the transit passage regime in the Strait. Iran claims that the innocent passage regime applies to vessels of such States moving through its territorial sea and that passage of all warships through Iran’s territorial sea requires prior authorization. The latter provision is not consonant with the Convention. Oman recognizes only innocent passage through the Strait for all countries and requires prior permission for passage of warships. The U.S. does not recognize some of Iran’s straight baselines along the Strait, arguing that Iran’s coast is neither indented nor fringed with islands in that area as required by the Convention to use straight baselines. That means that the U.S. does not recognize the full extent of Iran’s claimed territorial sea in the Strait. Moreover, it may not recognize Iran’s claim to the disputed islands west of the Strait and thus Iran’s territorial waters claimed therefrom. Although the U.S. is not a party to the Convention, it insists that the Convention’s provisions on freedom of navigation, including transit passage through such straits, are customary international law. This is debatable. Many developing countries argue that the Convention was negotiated as a package trading off provisions regarding preferential access and sharing of seabed resources beyond national jurisdiction for freedom of navigation, transit passage and archipelagic sealane passage for maritime powers. In particular, in the negotiations leading to the Convention, the U.S. agreed to a 12 nm territorial sea in exchange for the transit passage regime. There was no “transit passage regime” before it was stipulated and detailed in the Convention. The pre-existing regime was one of innocent passage in territorial seas. There are significant differences between the two regimes. The transit passage regime provided in the Convention states that “transit passage means the exercise in accordance with [the Convention] of the freedom of navigation and overflight solely for the purpose of continuous and expeditious transit of the strait.” Transit passage cannot be impeded, hampered or suspended. Innocent passage is a more restrictive regime. Such passage cannot be prejudicial to the peace, good order, and security of the coastal State. If a warship violates the innocent passage regime and, upon notification of the violation, refuses to comply, it can be requested to leave the territorial sea immediately. Of particular relevance here is that a warship in innocent passage cannot exercise or practice with weapons, launch or land aircraft, or undertake any research or survey activities. The U.S. repeatedly challenges Iran’s claims through “operational assertions” of the freedom of navigation. In the 2008 incident, the lead vessel, the USS Hopper, made a broadcast stating “I am engaged in transit passage in accordance with international law.” Thus it initially claimed transit passage – over the standing objections of Iran and Oman. If the innocent passage regime applies, the U.S. may have violated it, perhaps frequently. Video of the incident shows a U.S. helicopter hovering above the U.S. ships. This apparently contradicts the prohibition on the launching or landing of aircraft. 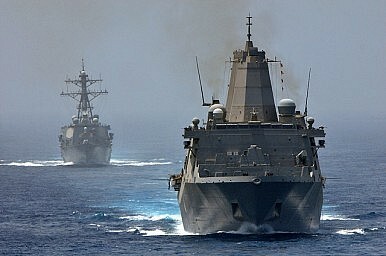 In an earlier incident, the U.S. Whidbey Island reportedly fired warning shots at an approaching small Iranian boat. If true, this would also violate the Convention’s innocent passage prohibition on “any exercise or practice with weapons of any kind.” Iran also alleges that U.S. Navy vessels frequently conduct survey activities of submerged wrecks during passage through the Strait. Yet this is prohibited by both the innocent and transit passage regimes. Nevertheless, the reality is that there is not much Iran can do about what it perceives as the illegal and provocative behavior of U.S. naval vessels. Given these starkly different positions, and the increasingly provocative actions by both sides, a buffer is needed to prevent overreaction. The establishment of a hotline between Washington and Tehran or their respective relevant military commands might help avoid unintended incidents or their escalation. Even better would be an “incidents at sea agreement,” or at least a mutual understanding of each other’s rules of engagement that could minimize the number of incidents or avoid their unintended escalation into broader conflict. This would be particularly important in these tense times. How Trump Can Strengthen US Leverage Against IranThe Far-Reaching Consequences of China's South China Sea Island-BuildingFurther Militarizing the South China Sea May Undermine Freedom of Navigation98-1: The US Senate Wants a Say in the Iran DealWhat Really Happened in the Persian Gulf on April 28, 2015?